The Sleep Cycle Alarm Clock for iPhone brought the pastime of logging sleep data and behavior to the mainstream, and having seen a bunch of apps and technologies emerge since then, companies and start-ups are now looking to up the ante. One group of individuals have dreamed up a very alluring, orb-like product that not only glows in the dark and looks amazing, but also does a pretty good job of monitoring you while you catch those all-important Zs. Most sleep-tracking apps can pick up on information like breathing patterns and movement, but the Sense sleep monitor offers just about everything one could need to both keep abreast and make improvements to sleep. 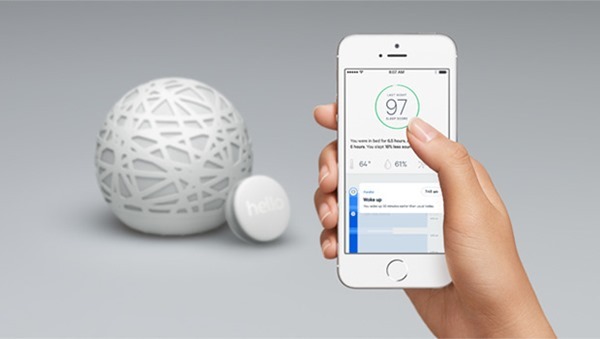 It can detect your movements, of course, but also elements such as air pressure and humidity, and by consuming all of this relevant data, can feed you information such as the perfect room temperature for optimum sleep. The idea is, in itself, quite ingenious, but the execution is also spot-on here. The polycarbonate-clad design is very noticeable, but also inconspicuous enough so as not to distract you while you’re rested. Information is pushed through to a companion app on your smartphone, so you can check the information gathered no matter where you may be. By monitoring a myriad of factors, Sense determines your quality of sleep and gives you a ‘score’ at the end of it, and after a short while of using it, you’ll likely have made the necessary adjustments so as to ensure a very comfortable night’s sleep every time. Until the likes of the aforementioned Sleep Cycle Alarm Clock, many of us didn’t really hold sleeping in such high regard. We’d spend a lot of time tracking information on fitness, calorie burning and other such activities, but in actual fact, sleeping is just as important as breathing, eating and exercise for remaining in good health. The Sense sleep monitor is currently on Kickstarter, having smashed its original target of $100k and almost reached the million-dollar mark at the time of writing. Given that there are almost four weeks still to go, there’s definitely scope for that number to double or even triple, and with backers seeing a $30 discount on the eventual $129 asking price, interested parties should definitely indulge sooner rather than later. Check the video embedded below, and to pledge your interest, check out the Sense Kickstarter campaign page.